We first made our Curry Lamb Shanks Recipe months ago on a whim and it turned out amazing. There was a lot of talk of making this into a video recipe for you guys, but we never got around to it until now! 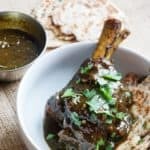 We not only created an incredible curry lamb for you, but we made a video showing you how to make them, along with garlic naan! Check it out below. We learned the proper way to cook lamb shank the hard after our first go at trying to cut it off the bone. Fore shank is really tough and muscular which makes it perfect for slowing roasting it ON the bone. And, when we say slow, we mean you want to start prepping dinner 3 hours in advance because it needs (in our opinion) atlas 2.5 hours in the oven! Low temp, long cook time, and you find yourself eating tender, fall off the bone curry lamb shank! Shanks: our Favorite Cut Of Lamb! Lamb shank if our personal favorite cut of lamb. What we love most about working with the shank of a lamb it can transform over a couple hours with a couple simple steps. If you've ever seen or held a lamb shank before you know how tough and meaty it is. Cutting it right off the bone can even be pretty difficult to do compared to many other meats. But, when it goes into the oven tough as can be and comes out fall off the bone tender, I am in awe. It's not only a beautiful experience to eat, but also to see! If you're worried about the complexity of the spice mixture, ease your worries because as we mentioned in the video, you can simply use curry powder as replacement! In my opinion, it does provide a different flavor, still intense, but intense in a different way, but you won't miss the curry! The color might even be lighter and more appealing to the eye. If this will be your first time using or even purchasing curry powder you should give our Coconut Curry Chicken and Curry T﻿ofu Nuggets a try! 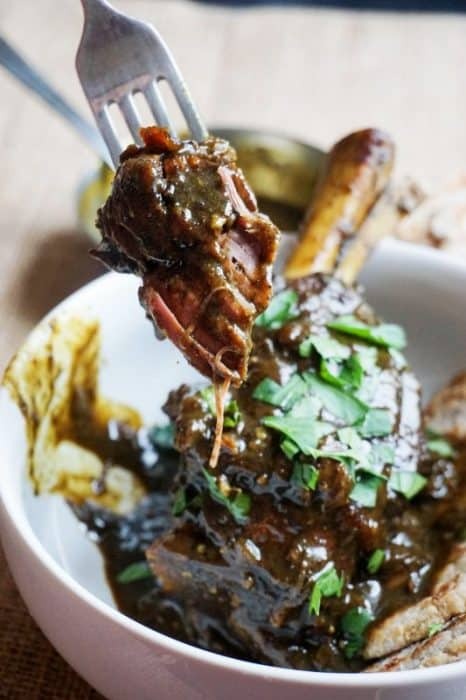 Although, curry powder makes a great topping from eggs to chicken, we think you're first hand at using it should be with our curry lamb shanks recipe! 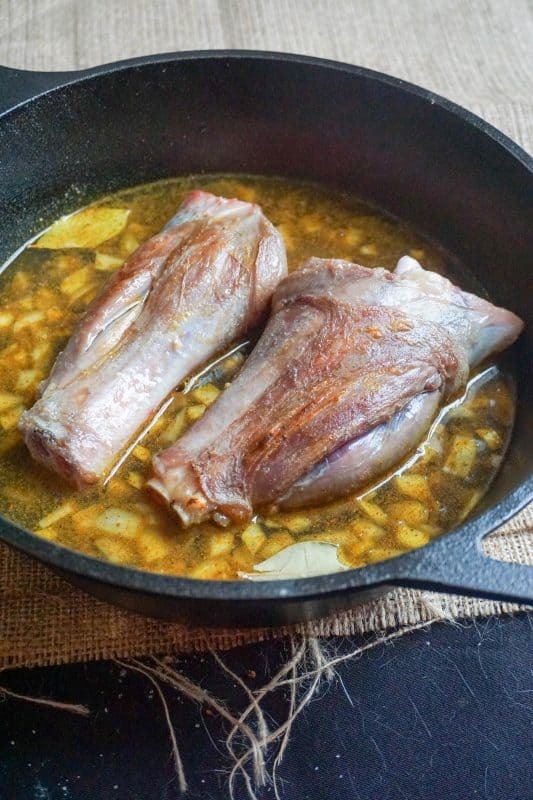 Recipe can be quickly added to MyFitnessPal - Search "KetoConnect - Curry Lamb Shanks Recipe"
Add coconut oil to a medium-high heat pan and once hot add the shanks to the pan and brown on all sides. TIP: make sure the pan or pot you use can be transferred from stove top directly to the oven safely. Once browned remove the shanks from the pan and set aside. Add garlic, onion and all the spices to the pan and mix around. Once you smell the spices (about thirty seconds) and the onion cooks down a bit, add the shanks back in. Cover the shanks with beef broth submerging them only half way. Depending on your pan or pot this could be anywhere from 2 to 4 cups. Throw in a couple bay leaves (optional), stir around and cover with a lid. Place into a 325 degree Fahrenheit oven. Check on it after 45 minutes and turn the shanks over gently (liquid is hot). Repeat this two more times for a total of 135 minutes. When you pull it out after 135 minutes, remove the lid and place it back in the oven for 20 minutes to allow the liquid to reduce. Remove the pan or pot from the oven. At this point the shanks will be fall off the bone tender. If you prefer to have your sauce more thick (like we do in the video), remove the shanks and reduce further on the stove top. Once sauce is to your liking, place the shanks back in and enjoy!